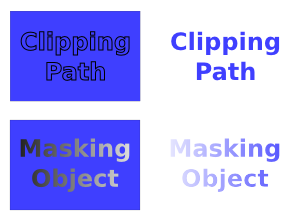 Clipping and masking are methods for restricting what part of an object (or Gruppo of objects) is visible. For clipping, a clipping path defines the visible part of the object while for masking, the trasparenza or luminosità of one object determines the opacity of a second object. In both cases, the target object is not changed and can be unclipped or unmasked if needed. A clipped or masked object can be edited (transformed, style changed, nodes edited, etc.) while clipped or masked. Objects within a clipped or masked Gruppo can also be moved relative to the clipping path or masking object if the Gruppo is entered.